Home of the ORIGINAL Glow-in-the-Dark Pillowcases! Comfy Cozy® has been creating MAGICAL Glow-in-the-Dark Pillowcases since 1994! 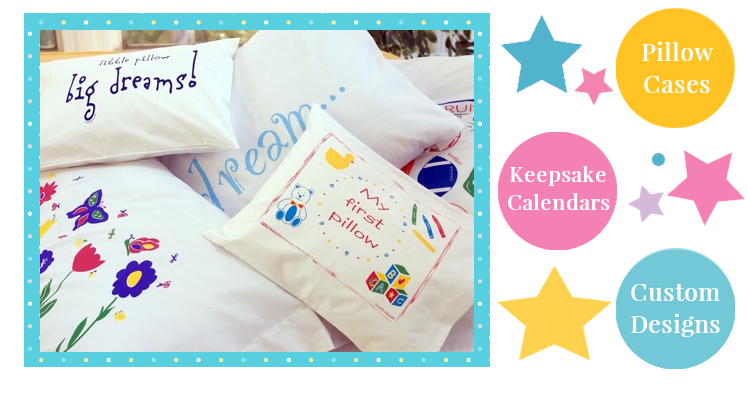 Our fun & functional line of products includes Standard and Travel/Toddler size pillowcases in everything from whimsical to inspirational designs. Our INVENTORY has been Updated! As we prepare to transition to the NEW version of Comfy Cozy,inc., we have a limited supply of our "classic" Glow in the Dark Pillowcases and Nightshirts. To ORDER, click on the "Available Inventory" link. To see our complete collection of original Designs, click on the "Classic Designs" link. Some designs are still available for Custom Orders. Please email us for additional information. We are continuing to offer the BEST selection of Keepsake Photo & Sticker Calendars you'll find anywhere! The start-at-any-month format means any day is the first day of the year. Our calendars are ideal for busy parents. We are expanding our Custom Designs operation and excited to work with you to create original party favors, corporate marketing items, family reunion or retreat gear and logo wear! With a wide selection of printable products, from tees, totes to towels, think "outside of the box" when it comes to creating promotional items for your business or logo wear for schools, sports teams, non-profits and businesses. Be sure to check out our Custom Designs portfolio. Thanks for visiting our site and checking out our Pillowcases & Calendars. We hope to add a little magic to your nights, inspire you to make every day a great day & make recording memories easier! We are certain you will find the perfect gift to match any age and personality! Like us on Facebook & to receive announcements and Sale codes!